If you knew you would be dead in the next 24 hours, would you take time to wash your friends and family’s feet? Wouldn’t that be a bizarre act? Well, that is one thing Jesus did KNOWING he was going to die. Jesus wanted the 12 disciples to know that he did not think he was any better than they. He was their master yet he wanted to serve them. The serving wasn’t to stop there but to continue with them serving others. I’ve often thought of Jesus washing dirty, stinking, calloused feet of his friends. 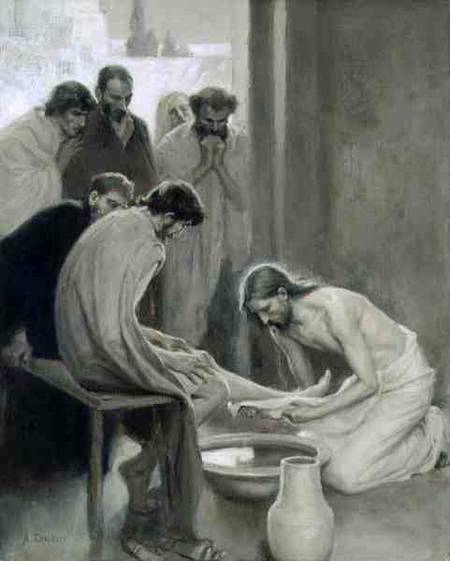 Here is the son of God that came down from heaven and all of its glory sitting on the floor of an upper room in some home in Jerusalem almost 2,000 years ago, humbly and gently washing 12 burly men’s feet. During the Holy Week, the main idea is that Jesus was crucified and while being crucified took on the sins of the world. However, we sometimes skip over the fact that the one of the last things he taught just hours before his death was to love and serve others. To answer my own opening question, I’m not sure how and where I would fit serving others in, but, yes, I would serve others in fullest capacity I could in those last hours. However, I can do it HERE and NOW without waiting….that is what Jesus wants us to place in our hearts and act upon immediately. Have a blessed day, friends. Thanks for sharing! Something to think about this week.